We gather together on Sunday mornings as a community of faith for music, worship, learning, outreach and fellowship. Everyone is welcome to come and learn ‘ukulele! Our ‘ukulele ensemble sometimes accompanies our music during the worship service. If you do not have an ‘ukulele, let us know and we will bring one for you to use. We welcome people of all ages and backgrounds to worship with us! 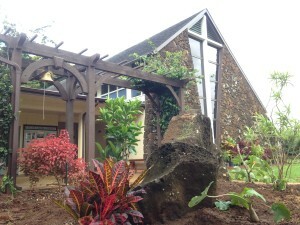 We worship in Hawaiian and English languages. Don’t worry if you don’t speak Hawaiian because our bulletin will lead you through our worship service and nearly everything is translated for you. Our worship services are designed to honor our traditions of the Hawaiian Islands and inspire you see God’s aloha in every part of your life and throughout the world. We celebrate Holy Communion on the first Sunday of the month. About 15 minutes into our worship service, children (preschool through grade 8) are welcome to participate in Sunday school. This is an opportunity for children to learn about the Bible and its stories about God, Jesus, the Holy Spirit, and God’s aloha for all people. The people of Kōloa Union Church gather for a meal in our Fellowship Hall (“Moore Hall”) after our worship service. Visitors are invited to join us for delicious food and a great time of fellowship! We occasionally meet off-site for the Aloha Hour or have breakfast instead. These special occasions will be mentioned on the homepage of our website. We have members, friends, and a kahu who are highly allergic to various scents, often resulting in coughing, sneezing, difficulty breathing and speaking, as well as other symptoms. Heavy perfumes and colognes are particularly troublesome. We are requesting that our church be, as much as possible, a “scent-free” environment during worship services, social activities and meetings. We realize that there is no way to keep all scents away, and we plan to continue having fresh flower arrangements each week and lei for special occasions, but we do ask everyone to be sensitive to the needs of those around them when it comes to perfumes, colognes and lotions. The choir is an important part of our worship service and they sing on designated Sundays throughout the school year. Everyone is welcome to sing with our choir! They have a huge repertoire, ranging from Hawaiian to classical to contemporary.